Join us for a town celebration at the Johnston Public Library on Saturday, December 1st from 2:30-4:30 p.m. 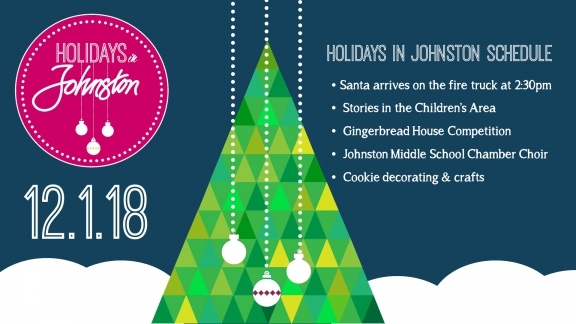 Holidays in Johnston will feature crafts, a performance from the Johnston Middle School 9th Grade Chamber Choir, cookie decorating, a gingerbread house contest (download an entry form), entertainment, food and fun. Santa will even make a special appearance on a Johnston fire truck! No registration is necessary. Holidays in Johnston is free and open to everyone. The Johnston Public Library is located at 6700 Merle Hay Road.